Never look a gift horse (or cow!) in the mouth. 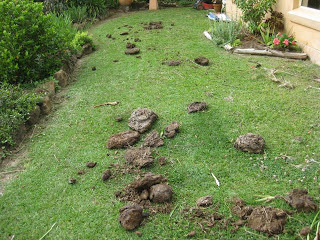 This old saying came to mind when Dave came round with the gift of a few bags of cow poo – ( I had tempted him with rainbow chard and basil seedlings). I was about to make a HOT COMPOST pile and this was just what I needed? 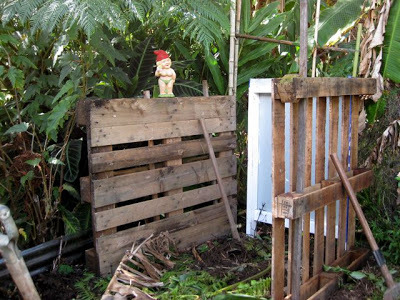 HOT COMPOSTING is all about striking it rich in your own backyard! It’s all about using what you have to make the best conditioner for your soil to give you the healthiest plants – and that means healthier for you – making sense yet? 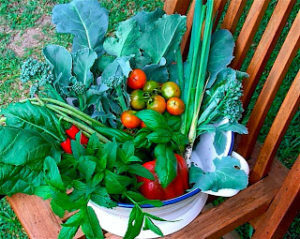 HOW MUCH WASTE does your home and garden produce? Do you know that a lot of this could be put to good use as vital components of a compost heap? Heap – WEEP! – that’s what I want to do when I see my neighbours raking up leaves and putting them in the garbage; tossing their lawn clippings in the bin; seeing green waste prunings poking out of the top of their wheelie bins etc. etc…………………………..
GARDENERS NEVER HAVE ENOUGH COMPOST – this is the life blood of good gardening – so let’s roll our sleeves up and get down to it. 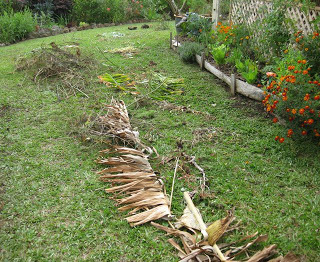 You make this in ONE GO – so get the mower ready, and all the garden waste that you can find. 1. WHAT YOU NEED TO GET YOU GOING: 1. A frame – I made this from old timber pallets held in place with some metal star pickets. 2. 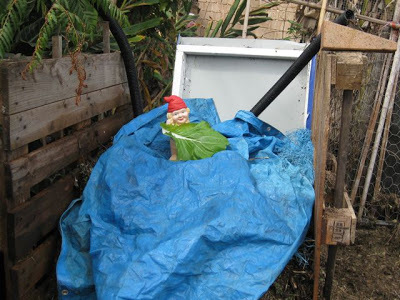 Flossie – the goddess of composting. THIS IS DIFFERENT FROM THE COLD COMPOSTING BIN METHOD. We are going to make something that is real SOIL FOOD and not just a SOIL CONDITIONER. 2. 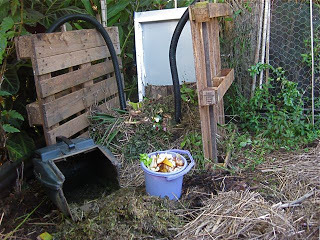 THE DIFFERENCE BETWEEN COLD COMPOSTING AND HOT COMPOSTING. When you make compost in a bin like this it is really only useful as a soil conditioner. WHY – because to break it down it uses the nitrogen contained in compost scraps – this depletes it of most of its available nitrogen – a valuable plant nutrient. 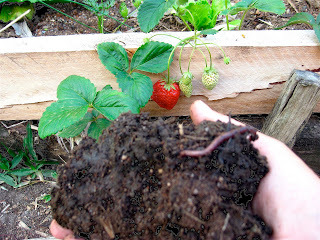 HOT COMPOSTING uses nitrogen from the air to activate the heap and therefore RETAINING much of the valuable nitrogen. FACT: Urine is extremely high in nitrogen and therefore too valuable to flush down the toilet. Use it to activate your compost heap!! IT’S FREE!!! 4. RULE NUMBER TWO – DON’T THROW IT AWAY – mow it up to put in the compost. Before I mow the lawn, I go around and do any weeding and pruning that’s needed, then it gets chomped by the mower (better than ending up in the tip?!) This makes the perfect combination of carbon to nitrogen to get your heap hot and happy – just right for your compost. 5. 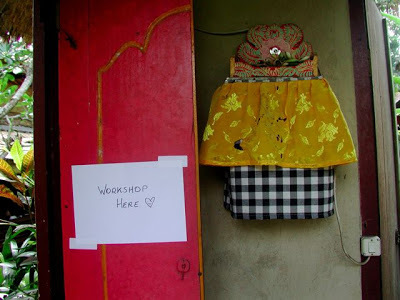 RULE NUMBER THREE – SAVE YOUR BACK FOR SALSA DANCING!. Compost piles need air, and most books will tell you to ‘turn them’. You can save yourself the effort by putting a couple of perforated pipes in the middle of pile. In Africa I have seen them replicate this by building the pile around several bamboo poles and periodically wiggling them – while dancing, of course. 6. RULE NUMBER FOUR – LAYER, LAYER, LAYER. Just think ‘lasagne’ and you will get it. 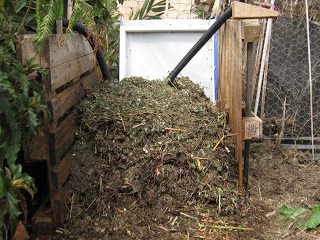 For hot composting you need about 50% GREEN stuff (fresh lawn clippings, animal manures, green waste, comfrey, green weeds, kitchen scraps, seaweed) to BROWN (dry grass, straw, shredded paper, dry leaves, wood ash). Repeat the layers and make sure to WATER EACH LAYER. 7. RULE NUMBER FIVE – Keep going until the pile is at least one metre square. It needs to be this big to work – to create enough heat so that the heap breaks down and kills any weed seeds. CONVENTIONAL HEAPS DO NOT DO THIS and you cannot put seeding and rooting weeds in them. Flossie, being unusually modest, working her composting magic! 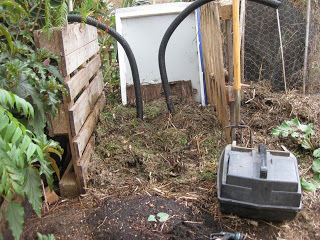 The compost is ready when it looks like this – happy days! 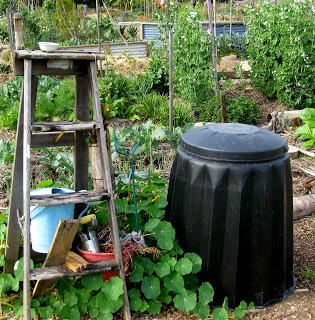 This kind of heap is ideal for the suburban backyard gardener, but if you have land and lots of waste, go to Hot Composting with Dave to see how to do it!